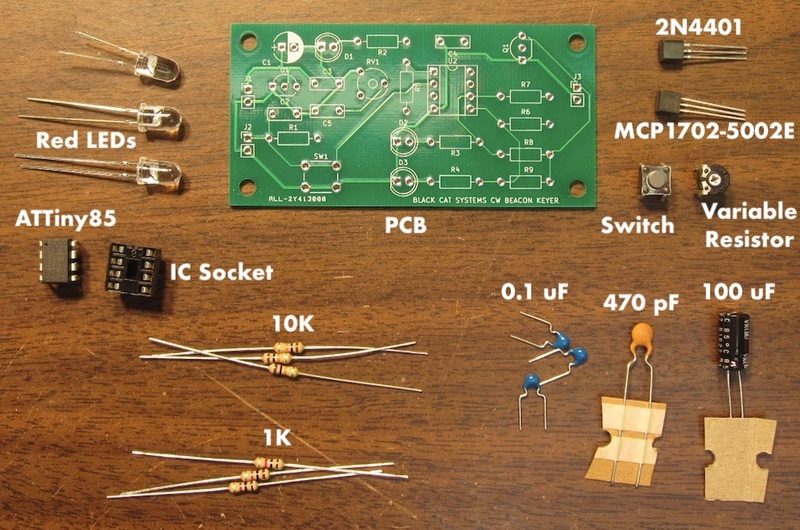 This keyer kit is ideal for controlling your ham radio beacon. It features a non volatile EEPROM which stores your message, adjustable in length from about 6 seconds to one minute via a trimmer pot. There is a built in pushbutton for entering your message, and of course you can connect your own key to use instead, which is ideal for longer messages. The key samples the key input and stores 4096 readings, the trimmer pot sets the sample rate and therefore total message length. So it will preserve your "fist". You could of course also send a sequence of random length symbols in addition to morse code, or vary the CW WPM. The board has an output that you configure, one of four possibilities. 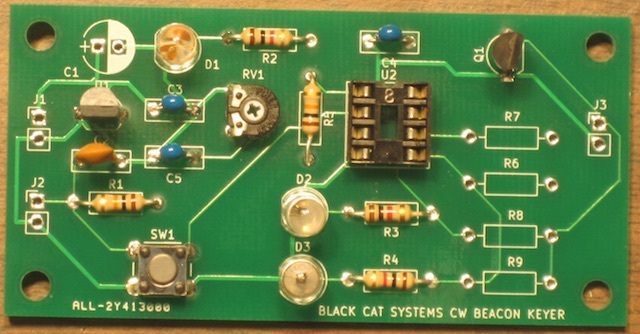 Either a 0/5 volt output to control the transmitter key input, either normal or inverted polarity. Or an open collector output which can sink current from the transmitter key input, again normal or inverted polarity. Programming the board is simple, and can be done repeatedly (the EEOPROM is rated for 100,000 write cycles), so you can change the message whenever you wish. Pressing down on the key to begin your message starts the recording process. A green LED turns on while it is recording. You can continue to enter your message, up to the maximum time set by the trimmer pot. When the recording period is done, the green LED will turn off, and the unit will sleep for a few seconds, so it won't start recording again if you accidentally tap the key. While recording, the red LEDs will turn on and off with the keydowns. 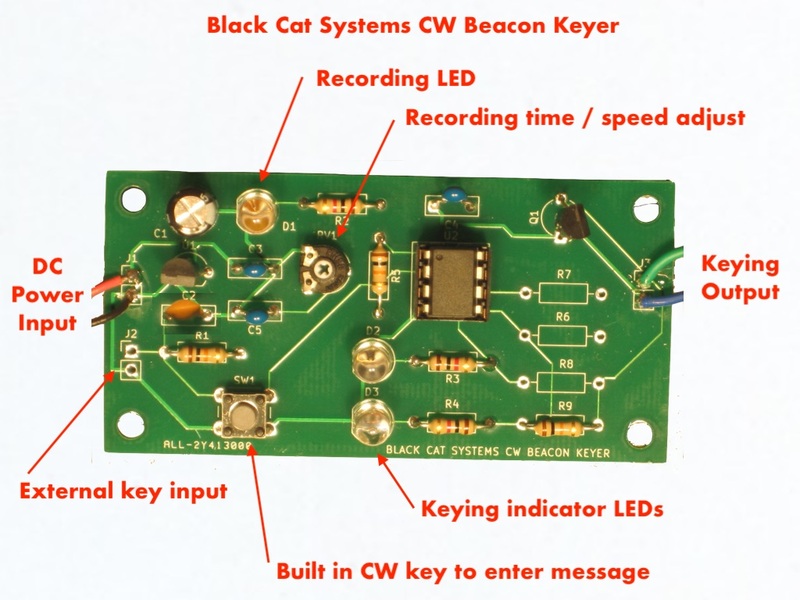 After recording is finished, the keyer will begin transmitting the message, and immediately repeat after the end, with no additional delay, so build the inter-message delay you want to use into the end of your message. 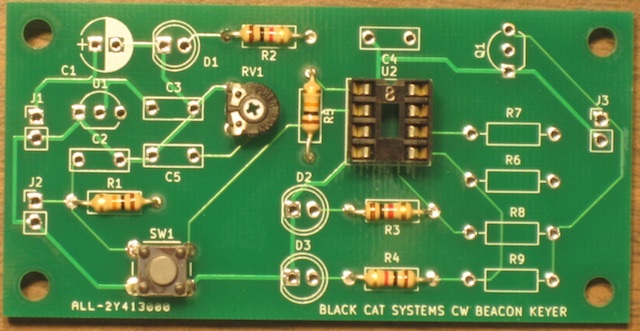 The kit includes the PCB and components, including a programmed microcontroller. Small size - just 3 by 1 1/2 inches. 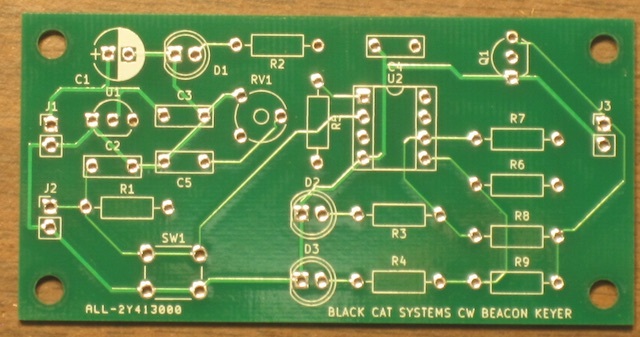 Easy to build, just a few components, all through hole, no surface mount. Full instructions on this page, just keep reading! You can contact me via email prior to ordering with any questions. 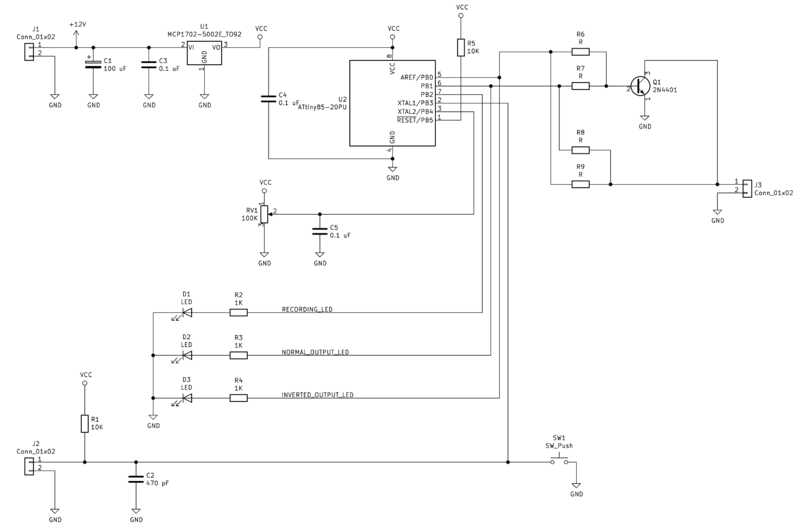 U1 is a 5 volt low drop out voltage regulator. 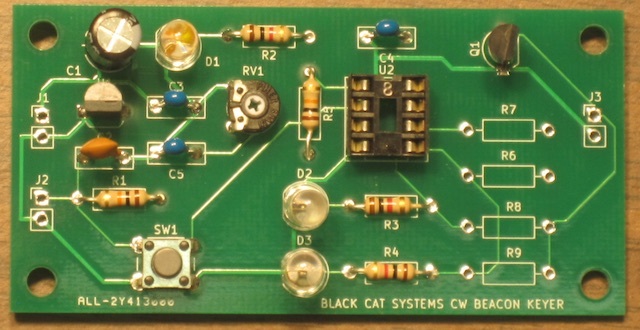 It, along with C1 and C3 provide the 5 volt power supply used by the microcontroller U2. Power to the board is applied at J1, maximum 12 volts. 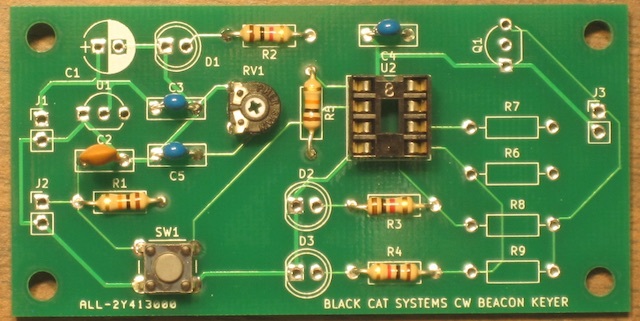 If it is desired to power the board from 5 volts, U1 can be left out and pins 2 and 3 of the U1 footprint shorted with a piece of jumper wire, although from testing it has been noted that the dropout voltage is nearly zero, and the board can be driven from 5 volts even with U1 installed. Current consumption is quite low, typically 5 mA, nearly all for lighting one of the two LEDs (10 mA when programming because the green LED is also on). Higher current draw would occur of course if a load is connected to the J3 output that draws current. 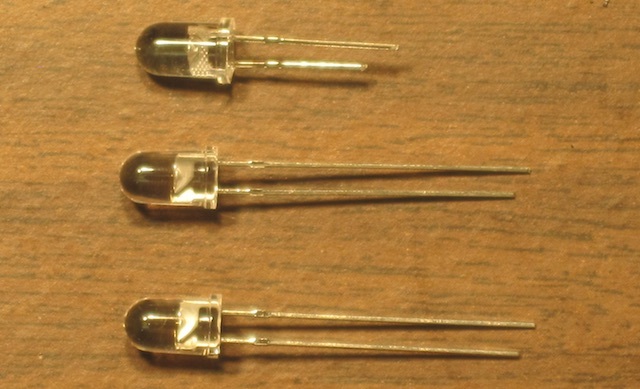 If even lower current consumption is required, R2/R3/R4 could be changed to larger values for less LED current draw (and a dimmer LED output) or even removed after programming the message. 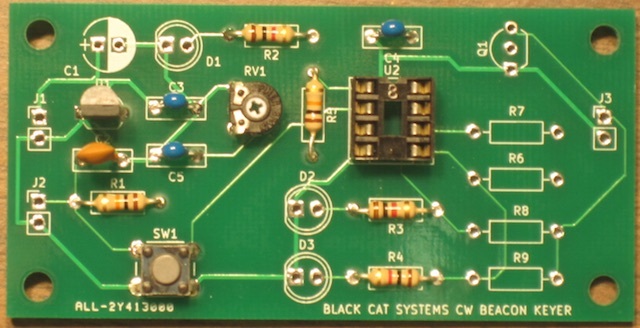 U2 is an ATTiny85 microcontroller, programmed with software to run the keyer. It has a built in oscillator. Pin 4 is ground and pin 8 is the 5 volt power input. Pin 1 is the reset line, held high by R5. Digital input PB3 (pin 2) is is CW key input, and is monitored by software. 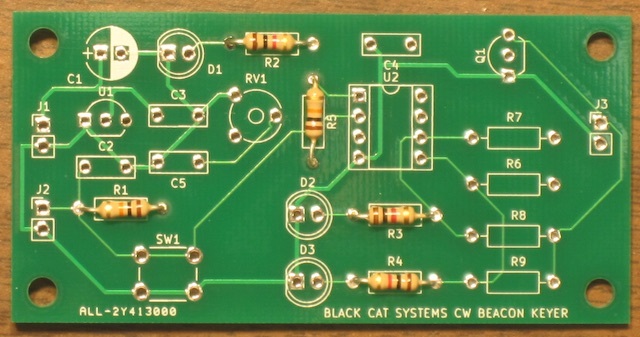 It is pulled up to 5 volts by R1, and C2 provides some filtering. There is a built in pushbutton SW1 that can be used for keying, and an external key can be connected across J2. Only a key/switch should be connected to J2, never a power source, or the board will be damaged. PB4 (pin 3) is an analog input, fed by potentiometer RV1. It is also monitored by the software, and used to set the sample rate for the CW message. Digital output PB2 (pin 7) drives green LED S1 to indicate when the board is in programming mode. Digital output PB1 (pin 6) is driven high when the microcontroller is keying the CW output line. Digital output PB0 (pin 5) is a complementary (inverse) signal. 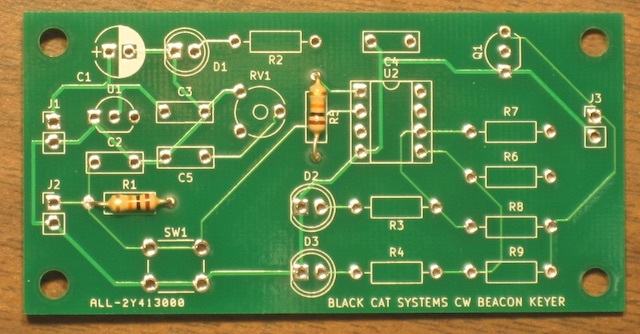 This allows for both normal and inverse keying, depending on the transmitter needs. 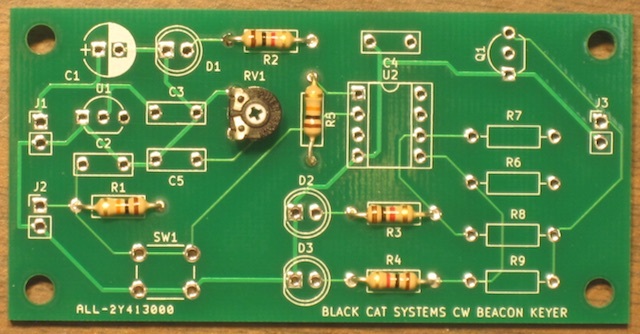 Install a jumper wire at R8, and the output is a 5 volt signal when keyed, otherwise 0 volts. Install a 10K resistor at R7, and Q1 will be turned on (sink current) when keyed, otherwise high impedance. Install a 10K resistor at R6, and Q1 will be turned off when keyed (high impedance), otherwise it will sink current. In the first two cases, Q1 is not used, and may be left uninstalled. Note: Be sure to only install one of the four options, or the board will be damaged. Also be sure to carefully check the keying requirements of your transmitter, to avoid damage. 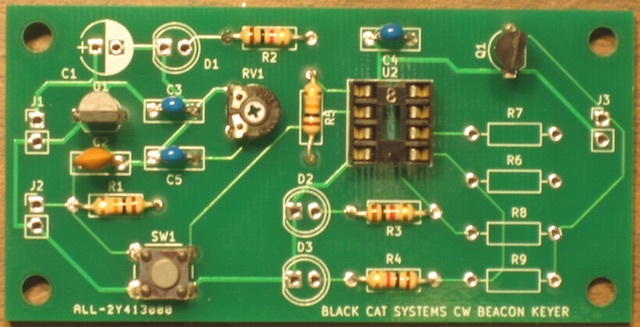 Black Cat Systems assumes no responsibility for damage caused by improper wiring, connections, or any use of the keyer board. Install the LEDs, taking care to install the right color and in the correct orientation. Now for the first test, powering up the board to make sure it is built correctly. I suggest not installing the microcontroller U2 for this first test. Also, you can power the board through a resistor, such as the 10K resistor which has not yet been used, if you want to be particularly safe. 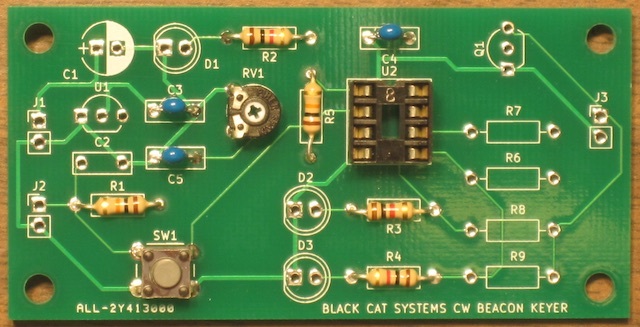 Use a 5 to 12 volt power supply, and apply power at J1, pin 1 is the upper square pin. Connect ground to pin 2. You should measure 5 volts on the IC socket from pin 8 (power) to pin 4 (ground). None of the LEDs will be on. If you do not measure 5 volts, stop, and check for construction errors. Do not proceed until the power supply is correctly working. Remove power, and carefully install U2 in the socket. Note the orientation, and make sure all pins are correctly installed (not bent). Make sure the IC is not backwards or it will get very hot and fail (ask me how I know). Rotate RV1 fully counter clockwise (CCW) for a minimum recording time, about 8 seconds. If everything is working well, one LED, typically D2, will be on. This is because the default EEPROM memory values are all 1s, so the output is keyed on the entire time. Press the pushbutton, and the green recording LED will turn on, D2 will also be on. Release the button, the green LED will remain on, D2 will turn off and D3 will turn on. You can press the button a few more times, each time it is pushed, D2 will be on and D3 will be off, vice versa when it is not pressed. After about 8 seconds, the green LED will turn off, indicating recording has finished. Then the unit will pause for about 5 seconds, and then it will begin playing the recorded CW message, which is probably just the random pushbutton sequences you entered. Next you can experiment with keying some actual morse code. You can of course connect a real key at J2, which will make it easier to send good CW vs the pushbutton. You can also increase the recording time by rotating RV1 clockwise. When you rotate it in playback mode, it will also adjust the playback rate, making it slower or faster than when it was recorded.